In this current series of articles (previous articles on the Risk Profile of a VC and Homerun dependancy), I am trying to increase transparency on the basic model of Venture Capital Funds. 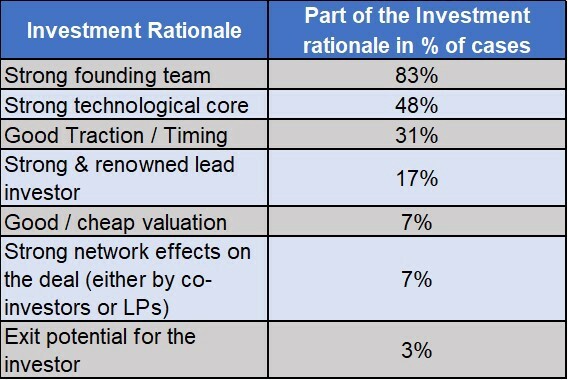 With this article, I want to explain, why there are good reasons to base an investment decision on team, timing and technology. In order to understand what rationales VCs employ in their decision making, I had to read through a lot of investment memos. I was able to distill seven investment rationales that are often employed in these memos. When looking at the ultimate exit triggered performance of deals I realized that there seem to be good reasons and not as good reasons for an investment. I will focus in the following on the three most often employed rationales team, timing and technology. To begin with, a strong team in the eyes of a VC has a complementary skill set, consists of experts in their fields and is able to weigh out focus and opportunism. A complementary skill set often comprises for instance of a technical expert (CTO), a business person (CEO) and a sales person (CSO). In that regard it is a very strong plus if the team has previous experience in its company’s field of business. Finally, focus and opportunism are nothing more than indicators for business sense. I have never met a company that was sold, running the exact same business model, it had pitched in its seed financing round. Business sense thus means to be able to make a decision at any time to grasp an opportunity and maximize value for the company or not do it because it would not maximize value. Interestingly, the absence of a strong founding team (e.g. a one man show) is one of the two main reasons to reject an investment opportunity (the other one being “too early”). Having said that and taking into consideration that 83% of investment decisions are at least partially based on a strong team, a team is to me rather an investment qualifier. Next, we need to discuss, what a strong technological core is supposed to be. To be honest only very few companies have a lot or even any patents at all or a technology that I would consider rocket science - and frankly they would not need it anyhow. In my opinion a technological core is thus something that provides a (sustainable) competitive advantage - at least when looking at companies with a digital product. And a technological product built with a lot of knowledge and investment is sustainable as it will be more difficult to copy. Furthermore, it can be more attractive for customers as it solves a problem more holistically. Finally, technology often requires implementation and thus yields a strong customer login. With 48%, almost every second investment was initially undertaken with the rationale of having a strong technological core. In fact, when looking at the performance of the companies that had a strong technology versus those not having a strong technology, the technologically stronger assets performed 1.96 times better (to be clear, performance was 196% vs 100%). Thus, a technological core is certainly a value driver for a portfolio company. Finally, let’s look at the 31% of investments made based in strong timing / traction. In early stage investments it is important that figures undergo a positive development even during due diligence despite the distraction caused by the fundraising. Since we are looking at companies that have only a very short history, the scalable sales channels are often not yet known and thus timing has substantial impact on the traction. In other words, Victor Hugo was very right - Nothing is stronger than an idea whose time has come. If now an early stage company is able to sell an innovative product to large customers in a comparably short sales cycle (strong traction), it is very likely that the timing for the product is really good - this can be caused by external events like technological breakthroughs or even regulatory changes. Performance-wise, companies that were invested in on the basis of good traction / timing historically performed 2.71 times better than others (to be clear 271% to 100%). Thus, traction and timing certainly are strong value drivers for a portfolio company. So, if I would have to say what gathers my interest in an investment opportunity it is a complementary team, a strong technological core and proof points that the time is right. I would thus give the advice to any founder team to start fundraising once these factors are met. Identify the core people, get the product on the road and try to build pipeline that can be closed during due diligence.